↑ Feinstein, S (2008). 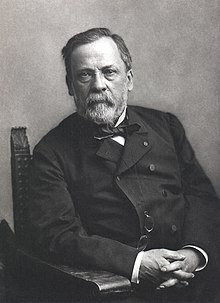 Louis Pasteur: The Father of Microbiology. Enslow Publishers, Inc.. pp. 1–128. आइएसबिएन 978-1-59845-078-1. https://books.google.com/books?id=0mwwzIdiuhkC&printsec. ↑ Hook, Sue Vander (2011). Louis Pasteur: Groundbreaking Chemist & Biologist. Minnesota, US: ABDO Publishing Company. pp. 8–112. आइएसबिएन 978-1-61758-941-6. https://books.google.com/books?id=D74c6On7eUoC&printsec.